Hey, there are two duplicated tiles on the preset of blocks on bloxbat tileset. It's the "rock specials"; this was present on earlies versions as well; but I forgot to report the first time I saw it. I noticed the scroll bar in units / structures is fixed now. Uh yes, actually I was thinking about the same thing, but for some reason (probably I forgot) I did not add this. But I suppose I will add this hint message when program is started for the first time and do re-upload once again. had a minor problem because I manually moved the maps from the original gruntmods path to match the vanilla dune 2000 one (original it's "dune2000\mission" but in gruntmods it's "dune2000\data\mission"; your previous editor couldn't find the good path so I just moved everything). I guess if I use your editor it tries first on the "data\mission" and mess things with the TESTMAP that it's saved. Right, the editor checks for existence of "data\missions" folder and if exists, uses it for storing TESTMAP. Otherwise it will use "missions" folder like vanilla. Humm, I don't know what exactly are you talking about. Can you clarify or give a screenshot? In the previous version, you couldn't scroll all the way to the bottom. Cm also noticed. You did fix that on purpose, didn't you? IIRC, there are two of each sort of crater in the tileset. It's not erroneous duplicates on Klofkac's part in that case. One of those sorts of craters might be buildable while the other isn't. This was present from... forever maybe. It's the type of thing "It's there, but it's something so small that I am not going to bother to post about it"; and later I just forgot (that and for some reason I use bloxbat less often that other tilesets). If I remember he fixe it before this final release, in 1 of the small patchs (when he uploaded only the .exe). You are half right. Those tiles are duplicated on the vanilla tileset as well; they seems to have the same atributes, so just leave them. But now, cheking more in deep, it seems that some other tiles are missing. The "Sand specials" show 4 lines of preset tiles, but there are others that appears on the whole vanilla but here no; but probably you can't add them because the limit of the keyboard. If you weren't aware, I can show the screenshot with the missing tiles; if you are aware, dunno if could be any solution, except when pressing the space bar (that change from the whole tileset to only the sand special) to show a third window with the remaining tiles, even if they are not preset from the keyboard. If you don't know, TileAtr editor has a feature called "Check block preset coverage" which helped me see which tiles were included in any key preset and which I missed. So I can easily see which tiles in BLOXBAT are not part of any preset. You are right about the reason that I ran out of available slots. I remember, when back in the past I was creating presets for each tileset, I considered those missed tiles being not that interesting and important to be included. But now I have idea to include them in the 8th free preset group, and call it something like "Sand stains". I didn't know that. That could be a good solution; at least on bloxbat there are 7-8 tiles that are not there, so would be interesting to have them. They may not affect the map, but still can be used to block blooms production withouth blocking the path (and not using only 1-2 tiles over and over). This one can be completed... or splitted. You can see that the two at the bottom are part of them too, so you can either place the 4 together at the same block or, if you are going to add a new section, split them and have the 2 vertical tiles as 1 block and the other 2 as another block. But anyway; you said you know exactly which ones are used and which not. So for example the ones I mentioned early (the second link) may be on the new block you are about to create and the stuff I pointed in the third link being part of the "special sand" (because this exact group of tiles are present on other tilesets too). I'm sorry I didn't find this stuff early. Since you made the preset blocks I forgot totally about opening the whole tileset. @Klofkac Hey mate, while you're around I've got a question about how the presets work. * - Figured it out. Original question is below here in case someone else is also trying to figure this out. Without the tiles together, the graphics are incomplete and I'm positive someone not as familiar with the tileset will miss that detail. If you could elaborate on how you achieved the result of that first screenshot, I'd be most appreciative! Many thanks. Edit: Also, I just thought of something. How about putting hotkeys for the presets in the block preset selection boxes somewhere? That might make finding the right tile a little faster. I may still run into problems with setting the attributes in the editor, so I'll report here if that keeps giving me trouble. Thanks for info, so I'll fix that. Hey mate, while you're around I've got a question about how the presets work. If you look carefully into the .ini files, you find section called [Custom_Blocks] in the end of file. There are defined blocks, which are not stored continuously in the tileset image. It's defined as width and height, and then as many tile indexes which compose the whole block. Then in block preset sections, you directly refer to a custom block by its number. Also, I just thought of something. How about putting hotkeys for the presets in the block preset selection boxes somewhere? That might make finding the right tile a little faster. Oh, awesome! My bad. Been using this program forever and still finding new stuff to learn about it. How come :, <, >, and ? are all duplicates of H? Could this be a glitch of some sort, or is it a syntax error? Wouldn't you mind if you send me your tileset .ini file? Will need to check what's exactly happening. The Tileatr file (TILEFEY1.bin) has no editor attributes at the moment. Still working on the presets in the editor itself before I go and do that. Figured I'd mention in case that's important. Also, entries 3 and E under preset 1 in what I sent erroneously have 3.3 rather than 1.1. I was in the middle of writing those up, so that's definitely not the cause of the problem. As you can see from this screenshot, there are four entries in the .ini, but it says "1 of 5" in the editor. The fifth entry is the crashed Ornithopter on SD platform, which I believe is... index #1 in Custom_Blocks. I hope that helps you track down the issue! Oh well, I found out what's going on. There is actually a limit of max 64 presets per preset group, and you exceeded that limit by 4 presets. And by chance, the presets for :<>? keys are loaded last and were skipped during loading. I recommend to use more different preset groups and move some presets from "Decorations" to some other group. (Btw, the limitation of 64 presets per group is some sort of design flaw). And now I see the tileset BLOXHILN is really non-standard and complicated one! Not something I was counting with when designing the editor. So it's quite a challenge to make a working configuration for it! Ah, thank you so much! That's great to know. And I guess that each parameter counts, not each index, right? Like, every "3.3.11.18" rather than every "1=." Maybe that'd be good to notate somewhere in the template. Indeed! I'm not an artist at all, but I managed to throw the thing together by editing the bridge tiles from BLOXXMAS. It's, uhh, a Heighliner tileset. It's built for compatability with D2k itself. For instance, orange rock craters ALWAYS show up on terrain where structures can be placed, so the use of orange platform was necessary to prevent the need for .r16 editing. And, it's built for combinations, so you can put any color tile on the other end of a platform border or any color atop another color of wall. I'm doing up this .ini since I'm finalizing the tileset for official release. There's already a WIP thread open following the progress of its development, and three test maps were created for it. Technically, the final copy of the file (in the scale test on page 3) is the complete tileset, but it has no editor parameters and one would need to select everything from the raw tileset file to place anything. That said, my ability to map with and configure this tileset is thanks to you! For the editor itself and for the advice you've given today. So, I owe ya one, or two. I think that's everything I'll need, provided the editor attributes work for me this time around. Thanks again, Klofkac! I'll hit ya up if I run into another problem, if ya don't mind. This program requires original Dune 2000 graphics files to work. It needs to know where Dune 2000 is located on your computer and will load graphics from that location. Please open any existing Map or Mission file under Dune 2000 game folder and the program will configure itself. Alternatively, close the program and configure all paths manually in D2kEditor.ini file under [Paths] section. In case you do not have Dune 2000 and want to create maps, you can copy tileset .bmp files (i.e. BLOXBGBS.bmp) into Tilesets folder. - Mitigated limitation of 64 block presets per group (which Fey encountered). There are still 8 * 64 = 512 slots, which can now be distributed freely among groups (for example in one group you can have 200 presets and remaining 312 can be distributed among others). That was very simple change. So those all were rather small things and the editor should be ready to go! (uh, this release takes time). One small unrelated idea. The BLOXXMAS tileset is missing corner bridge tiles, so you cannot make curved bridges (only straight ones). What if you add those corner tiles (there are at least 8 free unused tiles in tileset) to make that possible? Like new tileset BLOXXMA2 which could be useful for some interesting bridge-themed map. I was also thinking about Dune 2000 tilesets and I think they were not definitely used into their full potential. See, all tilesets look the same, the only differences are tileset-specific tiles (which is quite small part of the tileset) and some pixels here and there. I think they could have made better if they distinguished different areas on Arrakis more visually. That means there could be more significant visual differences among tilesets, something like temperate, snowy, jungle etc. tileset in Red Alert. There is some uniqueness about BLOXICE (as there are ice areas in it) but that's all what is really notable, the other tilesets are not that much different and could be merged into one with all the special tiles available in it. What do you think? What about making some more distinctive tilesets that would make various Arrakis places look more unique? Just downloaded the program (version from (EDIT: new version from 2018-12-02) ?) and just starting the program gives me errors. I cannot load maps (sort of same error). 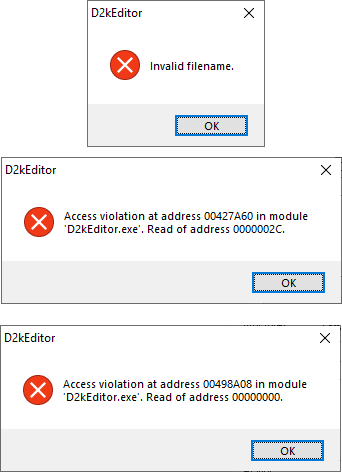 Access violation at address 00427A60 in module 'D2kEditor.exe'. Read of address 0000002C. EDIT: I cannot run the program alone? It still needs config and graphics files? Or if you download the .exe you just need to move it where you have the editor. When I do that I usually rename the original exe before moving the new so I can have both just in case. Thanks for fixing up the presets. I managed to make do and configure eight presets for the whole thing while dealing with the previous limits. You mean the corner tiles in my Heighliner tileset? That shouldn't be hard to do; I've got all the layers set up so I can just pluck the corner tile off the BP and stick it on sand. Add a shadow and it's done. With eight tiles free, it'd be possible to add both corners and turns to that tileset. If anyone else reading this is interested in that, please let me know! The more support for something, the more I'm inclined to do it. Given how that went, I figured I'd go ahead and do a full platform kinda tileset, but that was its origin - a workaround for rock craters on a grassy tileset. So, uhh... if you happen to know of any cool tilesets that might work out for Giedi Prime or Draconis IV, something from another game like Warcraft II or KKND, any suggestions would be appreciated. Dune is a vast universe and has a lot of potential to be awesome in a game. And Dune 2000 is a great game to work with. Advancements in modding the game have allowed for many possible changes. Mapping for it is simple and fun. The AI is very easy to work with, and working with it can have awesome results. The only problem left is that we're stuck on the planet Arrakis... but, hopefully, not for much longer! So, will this be finally the final release? That's taking so long, but I'm really happy we're trying hard to address all (even small and unnoticeable) errors, and do various improvements and tuning up! Finally I came up with a README file which is now included in the download archive and explains how to properly install the program and provides a few useful tips! Why I did't come up with that earlier? I hope you will enjoy this, and I would like to ask to update this on D2K+ site. Thank you! What a shame, I discovered a cosmetic bug. But the editor will ignore it and still will display "Thin spice" and "Thick spice" when selecting respective button on terrain editing page. EDIT: Actually not a bug, such thing was not implemented and is not even in the template. But would be a nice tiny feature. Good, the final final almost final release xD! Interesting, the readme, changelog and everything else it's fine to have for newcomers. Also I saw you added a link to my faqs; Did you saw it to check if I didn't say anything wrong? I tried to cover the usual errors people may get and even forcing errors using the portable version (which it's the old one, without the new units for multiplayer) to test what appears and what no. XD I didn't want to bother you with such a tiny thing, but it would be nice to have. Thanks for noticing it. @Gruntlord6 I uploaded the new version of editor to D2K+ site. Will you please update the existing download page with new version? Or is there anyone else who has rights to do that? Hey Klofkac, I have a question. There is a way to make the window's editor to open in maximize windown? When I open the editor (not just now, but since early versions too) my first step it's always click on the max button, then press F10, maximize, close, F11, maximize, close. It's an habit of mine, so if there is any way to make all those windows to appear at max size by default, adding or changing a line on the D2kEditor.ini file or something. I will start using the lastest version in deep soon.